Posted December 1, 2013 by Norburn Lighting and Bath Centre & filed under Landscape Lighting, Outdoor Fixtures . 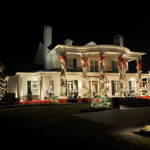 It is that time of year when we turn our attention to lighting the exterior of our homes, condos, townhouses and apartments with festive christmas lighting. It is also a great time to look at changing or enhancing your landscape or garden lighting to reflect the change in season and try something different. Check our FAQ section of our website http://www.norburnlightingandbath.com/tips-advice/landscape-lighting-tips/ to learn more about the different techniques you can use to create some curb appeal. For the best selection of outdoor garden and landscape lighting in the Vancouver area make sure to visit Norburn Lighting. All of our staff are factory trained ALA lighting specialist. We carry Hadco, Hinkley, Kichler, Quoizel, Progress, WAC and more leading manufacturers.